This Honda Elsinore is in beautiful condition and has never seen the dirt and is adult owned. This model is known as a cult classic collectible and I see many selling for a comparable price to my asking price that are in much less pristine condition. This vintage Honda 175 Elsinore has been babied and well maintained by a mature owner that held on to it and kept it as a "garage filler". There are several ways that you can become the proud owner of this excellent 1976 Honda Elsinore 175cc for Sale in Nevada. I might be willing to do a partial trade towards a Triumph Trial bike or we can do a straight forward cash sale where the motorcycle will be sold outright for $2,000.00. For more details and pictures, contact Mick by emailing him using the form provided by Strike Lightning's Used Honda Dirt Bikes for Sale gogocycles.com). If you are in Las Vegas, NV Nevada, you can make an appointment to view the motorcycle or email me for more pictures email me your questions and offers using the space below provided by Strike Lightning (and PLEASE include your contact information!) and I will respond with answers to your questions or after consideration of your best offer as quickly as possible. 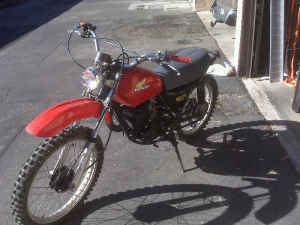 Strike Lightning would also encourage bikers to submit a review of the 1976 Honda Elsinore for sale to make the biker community aware of any problems that are common to this vintageHonda dirt bike for sale or to highlight its positive features and help potential buyers make informed decisions.